The Peoples Alliance for Freedom and Democracy (PAFD) held its first general congress between 21-25 March 2016 in Asmara, Eritrea. 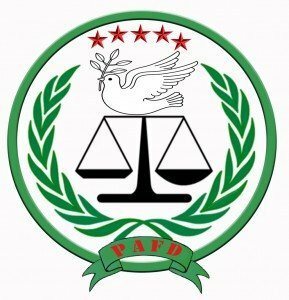 PAFD is a political alliance between the oppressed peoples of Ethiopia, including organizations such as the Oromo Liberation Front and the Ogaden National Liberation Front. The resolution of the first congress stressed the impact of oppressive policies imposed by the dictatorial regime on its own peoples. Delegates from Benishangul Peoples Liberation Movement (BPLM), the Gambela Peoples Liberation Movement (GPLM), the Ogaden National Liberation Front (ONLF), Oromo Liberation Front (OLF), the Sidama National Liberation Front (SNLF), Women and Youth wings of the liberation fronts, representing their respective peoples’ and the aspira-tions of all oppressed nations in Ethiopia convened in Asmara, Eritrea between 21st and 25th of March 2016 for the first general congress of ‘Peoples’ Alliance for Freedom and Democracy’ (PAFD). The delegates have discussed the status of their collective struggle against the dictatorial regime in Ethiopia and their collective experiences. The Delegates also deliberated on the current situation in Ethiopia, the horn of Africa and the world in detail and have set up strategies and policies to hasten the already progressing struggle for freedom and de-mocracy in Ethiopia. The Congress has elected PAFD’s Presidium, Executive Committee and Organization Bureau officials to serve its mission until the next General Council’s congress. In addition, the delegates thoroughly discussed and adopted the draft stat-ute, by-laws and various documents of the Alliance. The congress also called upon all the nations in Ethiopia to unite their rightful struggle against the current dictatorial regime. Furthermore, the Congress called upon the international community to stop supporting the current brutal re-gime in Ethiopia. The congress unconditionally condemned the ongoing killings all over Ethiopia. In particular, the congress strongly con-demns the current brutal suppression of the unarmed protesters in Oromia by the TPLF forces. Finally, the congress also condemns the wanton human rights violation and forceful displacement of rural people in Amara region, Beni-shangul, Gambella, Konso, Omo, Oromia, Ogaden and Sidama. Specifically, PAFD’s congress con-demns multinational corporations that collude with the Ethiopian regime against the poor agro-pastoral communities in order to expropriate their natural resources by totally displacing them from their natural habitats in Ogaden, Omo, Gambella, Beni-shangul and in other parts of Ethiopia. PEACE, DEMOCRACY AND GENUINE RIGHTS OF PEOPLES TO SELF-DETERMINATIONS!